You will enjoy the comfortable arrangement in the room with a King Size Bed and a Sleeper Sofa that is perfect for 3 people, or 2 adults and 2 children.. 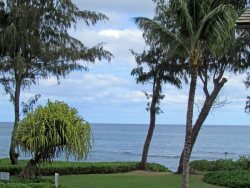 Your experience of being on the third floor is amplified ocean views, and the security of leaving your lanai door open at night to have the waves lull you to sleep. You know you have reached paradise when you stay in this incredible unit. We are excited to have unit 339 at Islander on the Beach in our collection. Great. Yes, it met our expectations. The website Was very accurate on how the condo is in person. Yes, it was wonderful! Easy to access the whole island, right off the bike path and has the most incredible views. We had such an amazing week and the location of the condo couldn't be better. Mahalo! We can't wait to come back! Reservation process - Fantastic! They really were great, very easy to get a hold of and they were so nice every time we spoke. Good communication and good recommendations. Thank you! Absolutely. Comfortable, great location, great amenities. Great! We loved it. Beautiful view, quiet, pleasant furnishing and decor. We loved to have the beach gear available. Everything worked out as planned. Very much so met our expectations, which also unexpectedly included a blender. Excellent. Everything was just perfect. King bed was very comfortable and had all beach accessories available. Great wall art and a true island atmosphere. Ocean and grounds view from lanai was incredible. Paradise. Will definitely come again next year! Yes - the condo was fantastic. Clean, quiet, and comfortable. I would stay again anytime! Yes Excellent - it was exactly as the pictures showed. I was very pleasantly pleased with the condo. The location was great, the towels, and supplies were sufficient as well. There was live music one night of our stay but if there was music move often that would been the icing on the cake.